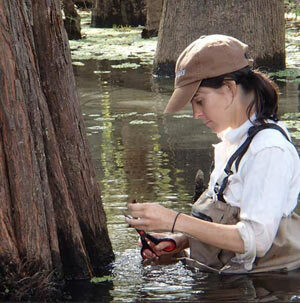 Liz Kimbrough is a PhD candidate at Tulane University in the Department of Ecology and Evolutionary Biology. You can find her in New Orleans studying endophytic fungi, playing her washboard, and writing about science for both mongabay.com and the Global Forest Reporting Network. Liz hails from the briar-patches of Alabama. At 18 she moved to Northern California to study Botany in the redwood trees at Humboldt State University. Her love affair with tropical forests matured during the summer of 2008, while living on the La Selva Biological station in Costa Rica, researching mycorrhizal fungi. After graduating, Liz worked as a research assistant in the Peruvian Amazon, conducted rare plant surveys on Pacific Northwest timberlands, served as the first Travel Intern for Appropedia.org, worked as a tutor in Italy, taught science to kids in San Diego, and became a yoga teacher. Liz began interning for mongabay.com in July of 2012 and quickly discovered a passion for bringing science and environmental news to the public. She has written over 40 articles for the site and is the writer of the “Innovation in Tropical Forest Conservation” interview series.